Digger Digger Dogstar illustrates the peaceful transition of power between outgoing president George W. Bush and incoming president Barack Obama. Remembering what happened on Election Day a few months ago, I’ll remind everyone to keep the comments civil, please. Cute. It is amusing though, that President Bush is depicted with a frown… I bet he is quite relieved to be going back to civilian life. Somebody is very relieved tonight. I think the frown must be replaced by a big smile! I think a much more civic handshake between two smiling men would have made a nicer vignette. Well said, snipfer. There has been no indication from anyone that President Bush was anything but helpful, friendly, and graceful with President Obama during the transition. What we have here is a LEGO representation of some alternate universe where President Bush was a jerk about the whole thing. Sorry, this MOC fails. I think you are judging it too harshly, Matt. I agree that the fig’s expression might appear to be negative, but it actually captures President Bush fairly well. He often does have a slight curl around his mouth; his lips (facial expression) and eyebrows are what imitators caricature when they play him. I think if the eyebrows weren’t set so strongly, this would not look so negative. And, frankly, I don’t think there is anything wrong or disrespectful with a MOC that illustrates some general and broad feeling–right or wrong–about the outgoing and incoming administrations. This is totally inacurate! President Bush didn’t have the slightest trace of a frown on his face as he left office…in fact, he was smiling and waving and very releaved! Bush did a excellent job as president, and now he is going back to normal life doing what he enjoys most. He earns our honor, respect, and thanks! Seriously, Bush has the bank account to keep a smile on his face for the rest of his life in retirement now. Presidents get bank! I think this is a bit of bias on the part of B-B for posting this. Bush has said nothing but good things about Obama and the two (and their “people”) made the transition as smooth as possible. He served his two terms and it’s someone else’s term. I wish them both well. Y’know… Bush was probably within the top 5 worst presidents we’ve ever had (I live in the US). I was completely relieved when he left, and I think we are much better off with Obama. Bush wasn’t most helpful, they didn’t let him more into the President Elect house early for no reason. I do agree through Former President Bush is most likely relieved to have left. Also relieved that he left are 73% of the people who think Bush wasn’t doing a good job. I’m more concerned about how big that dog is compared to a human minifig! I’ve said it before, and I’ll say it again – all these issues would be irrelevant if you were all to just VOTE SINISTER! I like the idea, although a little harsh. 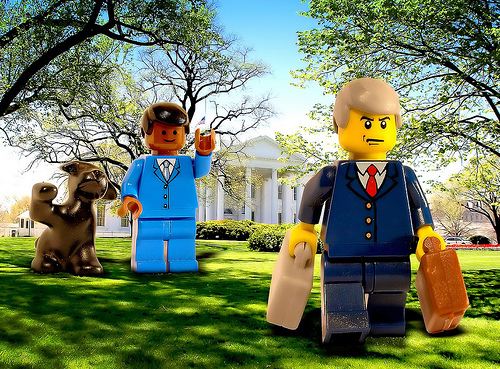 I would have loved to see a LEGO white house and background, I have never been a big fan of minifigs in the real world. It throws my perspective off a bit. This is a bias lego website. Do you even know what socialism is?!?! No! Your just a bunch of obamaniacs! I agree that the frown on Bush is out of place. I can’t even think of a time he did not have the goober-smirk on his face even when things were bad. Though Cheney with the whole wheelchair, grimace, and thrashing things with a cane? Yeah, that was pissiness. Heh. Also: Shouldn’t President Bush have been done in flesh tone? If there is any perceived progressive bias here on The Brothers Brick, it is entirely mine. I’m proud of my progressive family heritage going all the way back to the Revolutionary War, Civil War, and through to today. I’m proud to be an American, and I suspect we share more values — freedom of speech, freedom of religion, the importance of justice and the rule of law, the role of compassion in social and political life — than the issues we disagree about. That said, posting that others in the LEGO fan community had created LEGO-themed artwork to mark a specific historic event — factually and without editorial comment — hardly strikes me as biased. This thread is similarly veering off the rails, so I’m locking comments here too. Yes, that means I get the last word. It’s my blog.